Extremely soft, Gel type highly compressible with minimum pressure. Thermal conductivity up to 16 w/mk. 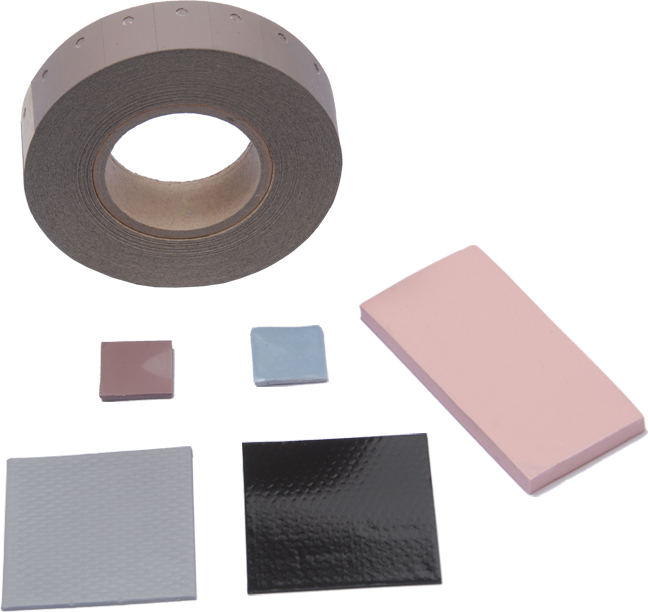 TIM-PAD is a family of thermally conductive and electrically insulating silicone pads. They are clean, production friendly and efficient alternative to mica, ceramics or grease and will provide superb protection against damage due to deformation, shock or vibration. Available with or without adhesive for easy handling and installation. Interface between a power transistor, CPU or other heat-generating components. Isolate electrical components and power sources from heat sink and/or mounting brackets. Interface for discrete semiconductors requiring low pressure spring clip mounting. Medical devices, military and industrial controls. TIM-PAD 1002: Cost-effective, maximize heat transfer from electronic components to heat sink or heat spreaders. Excellent mechanical and physical characteristics with efficient heat dissipation. Flame retardant with excellent cut-through resistance and resistance to damage from cleaning agents. TIM-PAD 1041: Offers high thermal conductivity (4.1W/m°k) and high dielectric properties. TIM-GEL PAD: Very soft, highly conformable pad provides superb protection against damage due to deformation as well as shock or vibration. Gel like modulus provides stress absorbing flexibility. Sheets and Rolls (multiple width available, inquire within.